« Sony PSN Update: The PlayStation Store Is Now Up and Running but Will it Stick? This week major companies have taken to the stage to introduce their new and future products. Having the E3 Expo and the Worldwide Developers Conference scheduled for the same week certainly provided a week full of exciting news and entertainment for customers. At E3 companies like Sony, Microsoft, and Nintendo all provided insight into their latest developments that included PlayStation Vita, Nintendo 3DS, and Nintendo Wii U. Apple was the first to publicly display their future software products at the Worldwide Developers Conference that took place on June 6, 2011. There had been a lot of talk leading up to Apple’s announcements, even more so than usual since this year they went so far as to provide an outline of key topics prior to the conference. Among the announcements made by Apple was the new iCloud, OS X Lion, and IOS 5. We have been hearing rumors for some time now about Apple’s new iCloud product which for the most part have all been confirmed. To learn more about iCloud you can visit our “Apple iCloud Rumors to Be Addressed at the 2011 WWDC” blog post and to learn more about OS X Lion check out 9 Things to Know about Apples latest OS. Bringing us back to IOS 5, like OS X Lion this software version introduces a ton of new features. Here is a round-up of some of the key features that IOS 5 will have to offer when it becomes available later this year. IOS 5 will offer over 200 new features and is expected to be available in fall 2011 for the iPhone 4, iPhone 3GS, iPad 1, iPad 2, and the iPod touch. The following is some of the most prominent changes of IOS 5 from its previous versions. Users will no longer have to connect to a PC in order to activate and set up their device. Automatic updates will now download directly to the device. When combined with iCloud, file sharing, transfer, backup, and restore will also be expanded upon. The new Twitter integration enables users to sign in, store their information, capture, and Share instantly from any application on your device. . Once the account information is saved, users will have the ability to Tweet from non-Twitter applications such as Maps, Safari, and YouTube. No more in app disruptions, notifications will now appear quickly at the top of the screen and can be accessed in the new notification center. The notification center collects and categorizes all notifications until the user addresses them. IOS 5 now offers tabbed browsing on the iPad and also adds a reading list for both the iPad and iPhone. The reading list saves article for later reading and with the use of iCloud the saved pages can be transferred across devices. The Safari Reader feature gives users the option to unclutter web pages. This option removes the unnecessary portions of the page and provides users with a cleaner reading experience. The iMessage feature is built into the messaging app and lets users send free unlimited text, videos, and pictures to other IOS 5 users. This feature also lets users know when someone is typing a response to their message and also enables them to switch devices while continuing the same conversation thread. Reminders work the same as in previous versions but now they allow users to assign a location which activates the reminder. For example if you schedule a reminder to “pick up dinner on the way home from work” if you forget, when you are passing the restaurants address your phone will alert you. The mail app now offers rich text formatting (bold, indentation, underline), message flagging, draggable addresses, and improved security. Like most of the new features, email can also be synced over IOS 5 devices using iCloud. On IOS 5 the camera is also located on the lock screen making taking pictures easier than ever. No more missed photo opportunities because it took too long to type in your password. Camera options also enable users to take the picture using the volume up button, pinch to zoom, and perform simple editing like crop, rotate, redeye reduction, and simple click enhancement. These are only some of the many new features that IOS 5 has to offer. Other features include split screen keyboard thumb typing for the iPad, a more social game center, newsstand, WiFi sync, multi-tasking hand gestures for the iPad, and Air-Play for the iPad 2. 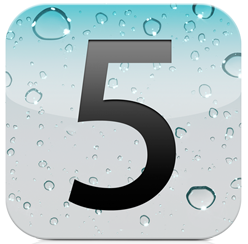 IOS 5 is expected sometime around September, until then you can learn more visit Apple IOS 5 Features. This entry was posted on Wednesday, June 8th, 2011 at 1:39 pm	and is filed under Mac, Software. You can follow any responses to this entry through the RSS 2.0 feed. You can leave a response, or trackback from your own site.